At the two-hour drive from Los Angeles is located, for me one of the most beautiful cities of California, San Diego. It stretches from the Pacific Ocean in the west to the desert in the east. 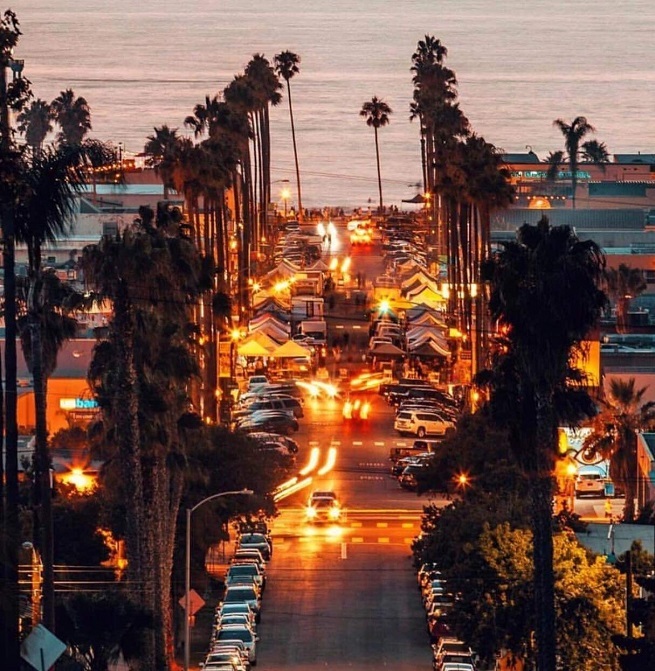 The southernmost city of California is known for its beautiful beaches, warm climate and outdoor attractions. However, it is not just to San Diego interesting, extremely interesting. Just before San Diego (if coming from LA) is located in the coastal town of La Jolla. 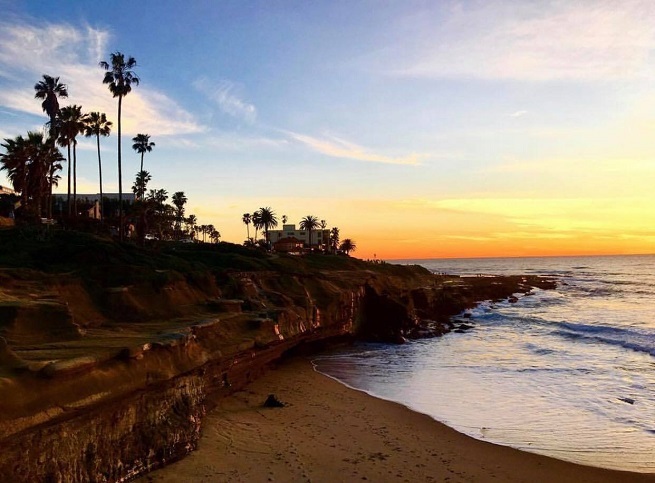 Surrounded by ocean, picturesque cliffs, about 11 km long coastline along the Pacific and caves accessible only by water (heaven for surfers and divers), La Jolla can be translated from Spanish as the Jewel. An appropriate name for an elite suburb of San Diego. If you find here in the late afternoon or early evening you can enjoy a beautiful sunset. La Jolla is a place where the time is once upon a time stop. Quiet, sticky smell of summer and it rolling “siesta” time is unlimited and stress just makes you stop and realize that you are in another dimension. The atmosphere of the twenties feel in every facet of the hotel with a garden where musicians perform light note, and the couples dancing as if they were lovers escape from the world. La Jolla has painted murals of past, present, hugging the ocean and quiet. Very pleasant and unique way to spend half a day exploring the La Jolla foot is just that murals famous and recognized artists, scattered throughout the city. 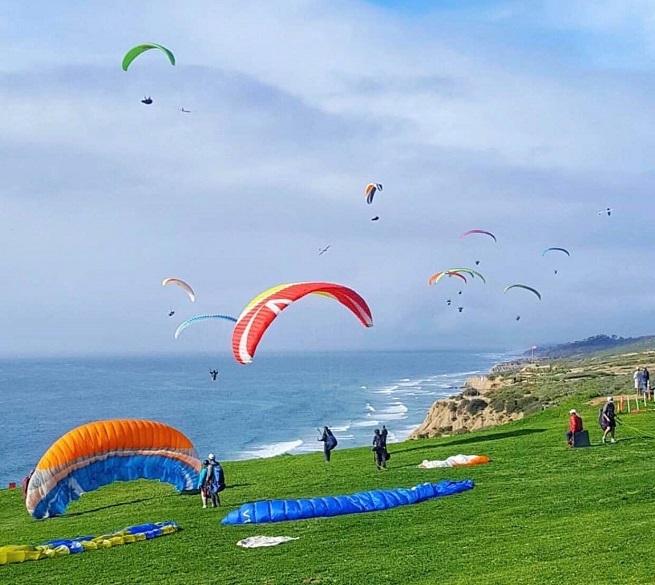 I mentioned the cliff, where is the starting point for paragliding and flying dragons. 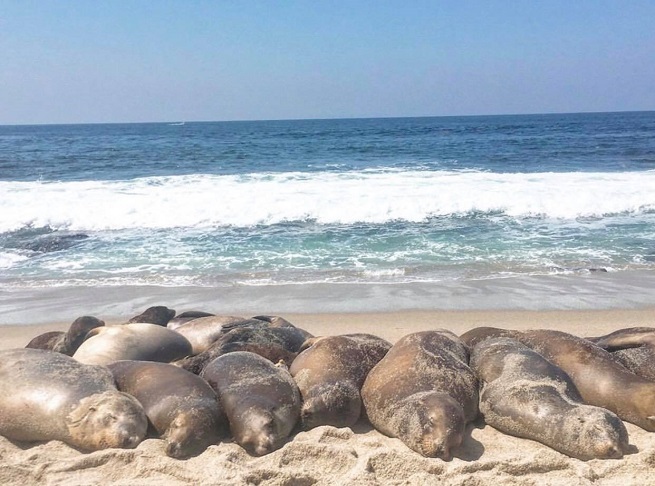 A whole coast with the center is home to many families of seals, which are a real tourist attraction. The first thing we noticed when we arrived in San Diego is that it is quiet, gentle and sympathetic city. It’s in that moment felt good, especially because we came from Los Angeles, where we spent hours in traffic. This more or less everything can visit on foot (expanding downtown) or transportation. Generally we don’t like to go around and see tourist attractions, however, in this city simply impossible not to stumble on them. I like in San Diego that strange mixture of modern Western and Hispanic – Southern culture since the borders and Mexico’s first city after the border Tijuana a half hour drive from San Diego ( of course, provided that the borders easily and quickly pass, which recently was unfortunately not the case). This mix we have noted in the architecture, cuisine or in everyday life. 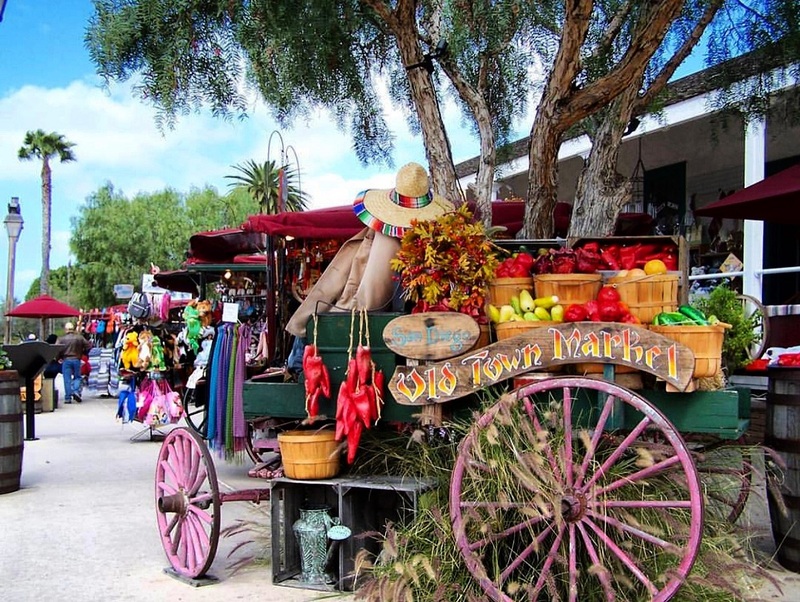 First we went to a part of town called “Old Town San Diego”, a typical tourist town, which liked me (which is not the case with tourism attractions). I love patchwork, millions of colors .. (my boyfriend commenting that this is kind of crazy), so I enjoyed the most in this place. It’s part of where the city began to develop. 1968 was declared a historical park and the whole area is practically a museum. 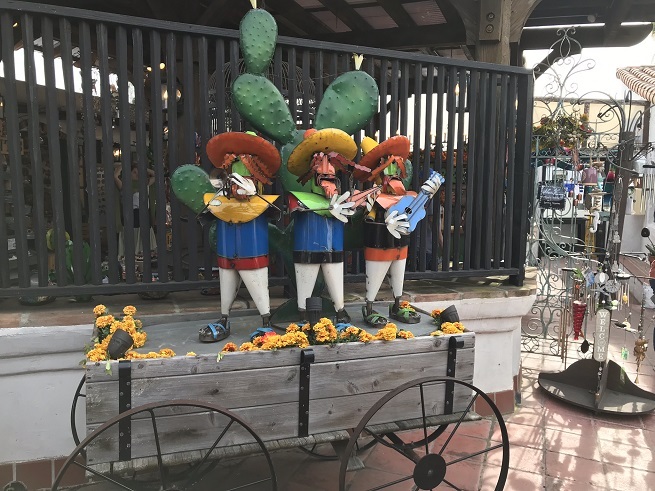 We got to know of the history of San Diego and enjoy a walk, greenery, flowers and margarita, of course (intentionally singular). 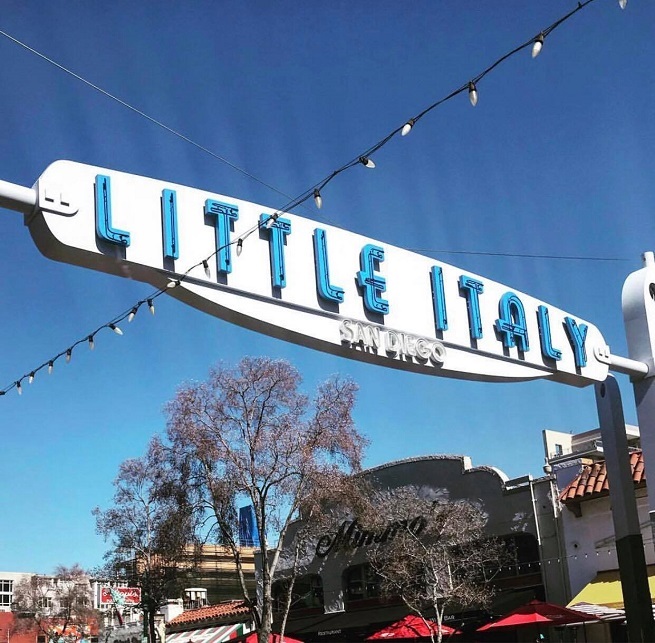 Few tram stops away is the part of town called Little Italy. Once upon a time it was a fishing community of Italian immigrants. Today it is one of the oldest and most elegant historical areas in SD. The concept is the main street that contains a large number of restaurants, cafes, bars and a lot deli with local and craft beer (it has become a hipster quarter). This urban neighborhood now has a large number of designer shops and art galleries. We did not go around the center point of assembly, a market which in this work is with local fresh produce, fruits, vegetables, flowers .. When we explored the length and breadth of this part of the city we went down to the Maritime Museum. USS Midway aircraft carrier is one of the largest ships of the US Navy by the end of the 20th century anchored in the harbor. Today it is of concern to a large number of visitors and faithfully captures the time when he was active in the service of the US Navy. This famous aircraft carrier naval fleet open to the public but we were interested to get to it and to explore it. I have to mention that the SD is Top Gun pilot school and was filmed a movie here. 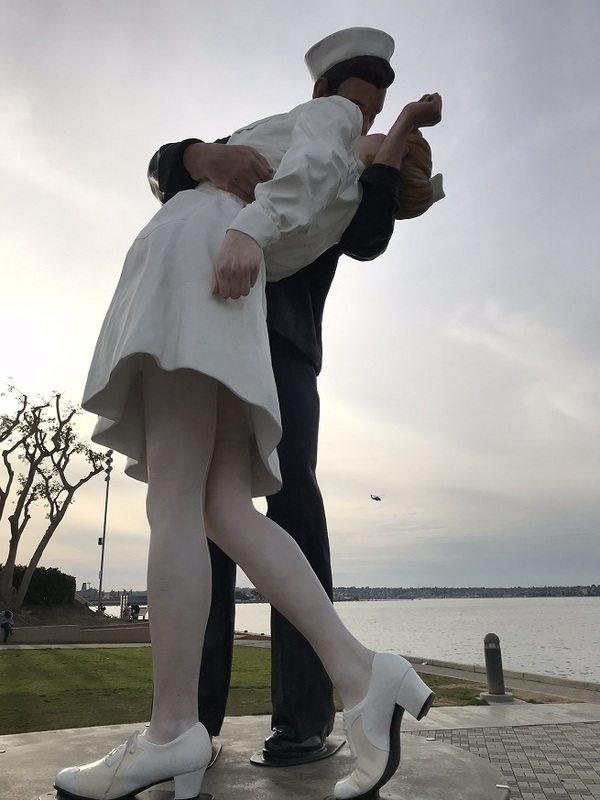 Right next to the carrier of the sculpture “Unconditional Surrender Sculpture”. Sailor who in her arms kissing a girl in a white dress. Inspiration for the same image that is created during the celebrations at Times Square in New York after the victory over Japan in 1945. 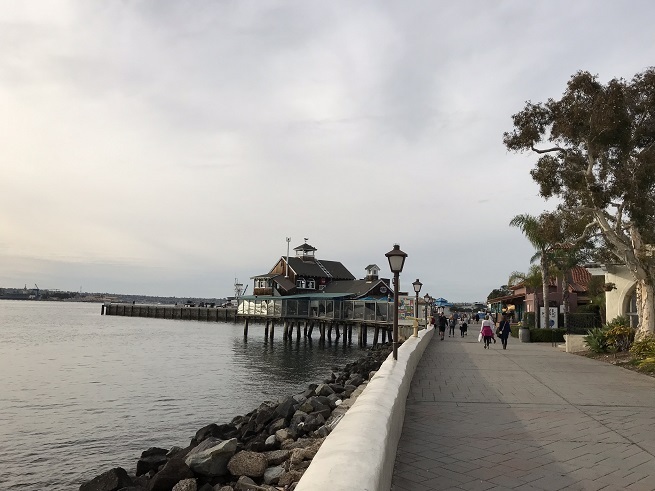 We walk further along the coast past the Seaport Village. 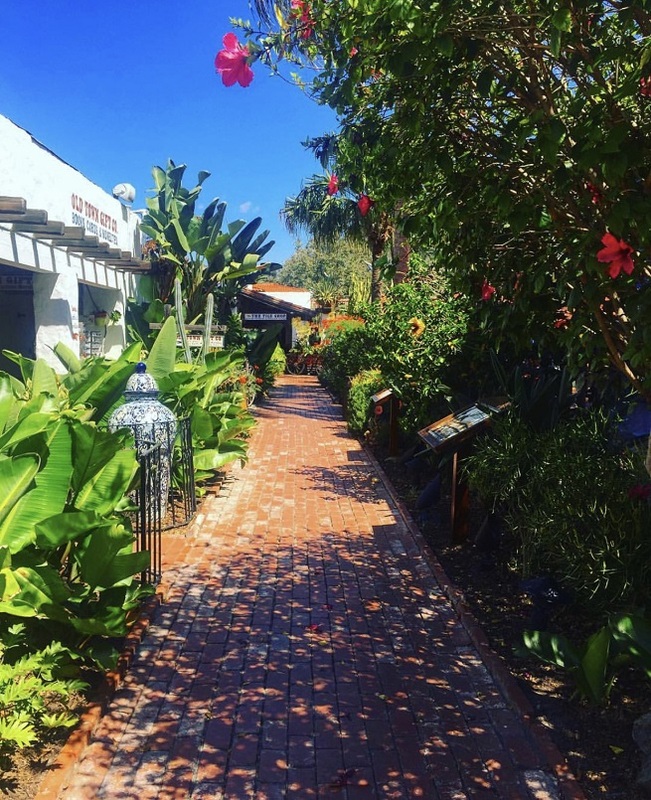 It is located along the bay in downtown San Diego and its picturesque views of the coastal charm is the ideal place to spend a few hours. Despite being a favorite destination among tourists and local families gather here on weekends. A large number of unique shops, restaurants, beautiful countryside for hiking is what you can find here. The old architecture is noticeable, although right next to it are huge buildings and hotel chains. On the other hand leads to the marina with precious boats and yachts. Across the center of the island, the elite residential area of ​​San Diego. Easy to reach the bridge of the neighborhood. On the sandy beach of Hotel Del Coronado in which he recorded in 1959 film “Some Like It Hot.” The island offers a beautiful view of the SD. 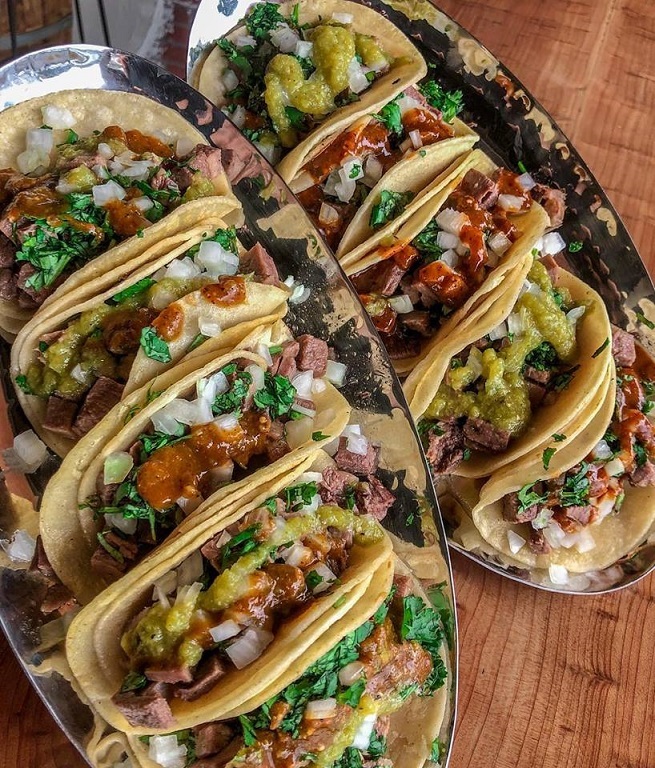 We continue to the Gaslamp district, the historic city center, pedestrian zone beautiful streets where you can find the widest variety of food and bars from all over the world. Neighborhood stretches for several blocks and is composed of a combination of modern office buildings of glass and concrete apartment buildings, a variety of colors and styles of modern architecture on the one hand and colonial style on the other. In the evening, when the inflammation decorative lamps in the streets in this part of town you can feel the romantic atmosphere of the old days. For me it is a good impression. 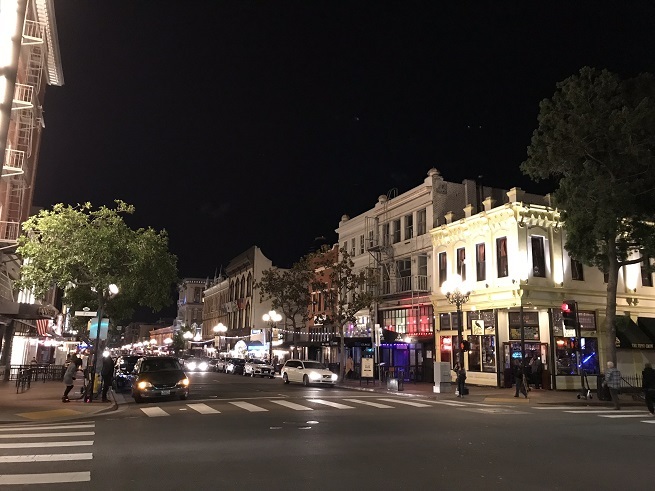 San Diego campus is full of young people, bars, clubs and other entertainment. We have noticed that it is quite clear that even the homeless significantly less than in LA. The city is covered in greenery and has a large number of parks. 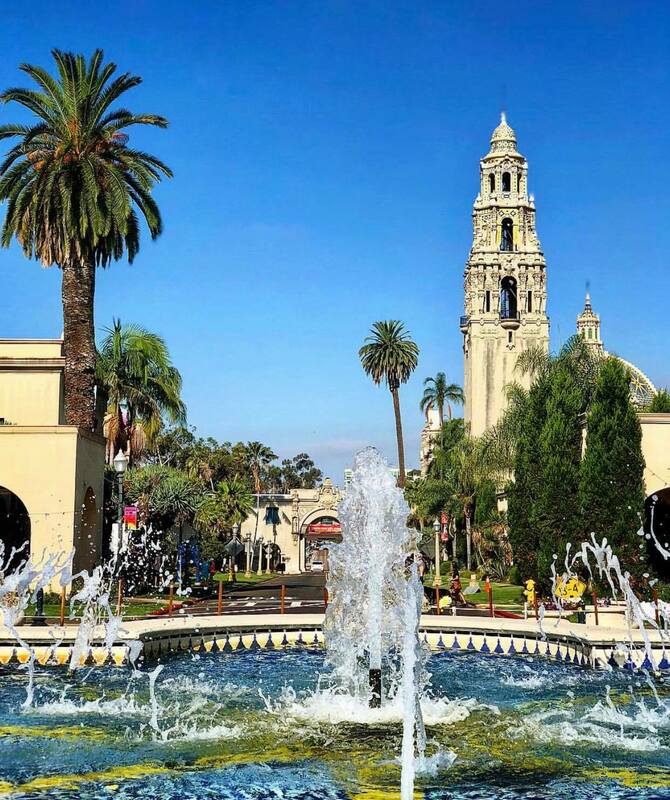 One of the most famous is definitely Balboa Park. It contains a large number of museums, botanical gardens and gardens, theaters, music pavilion, monuments and takes a long time to visit it. We did it by bike. Somehow, it seemed to us that we are both at least tire. Size of the park, its vastness and richness of plant and animal species but also how everything is well designed, incorporated, adapted really is an unforgettable experience. Also, this is one of the largest and most beautiful zoo in the world, where most of the animals practically live in their natural environment. This zoo is considered one of the best not only in the territory of America. We did not manage everything that was on the list to see and visit. This city has plenty of beaches to visit. But since that time there was no bath, we decided that at the expense of something else they leave out. We did not have time to visit the Wild Animal Park and Sea World, perhaps in the future indicate a second chance, who knows. San Diego has all the advantages of small and large city. Basically it is a quiet town with a fantastic climate. A lot of contrast and diversity in a small space. For the short time we spent in it can freely say that we enjoyed. Our road leads to Nevada and Las Vegas.